UNIVVAR - Universal VaR Add-in "Value-at-Risk"
VB.NET/Visual Basic/VBA, C/C++/C#, Java, Python, Fortran, etc. running on all major versions of Windows. UNIX (Solaris, Linux, AIX) static and shared libraries available. C/C++ source code license also available. please click on their title below. 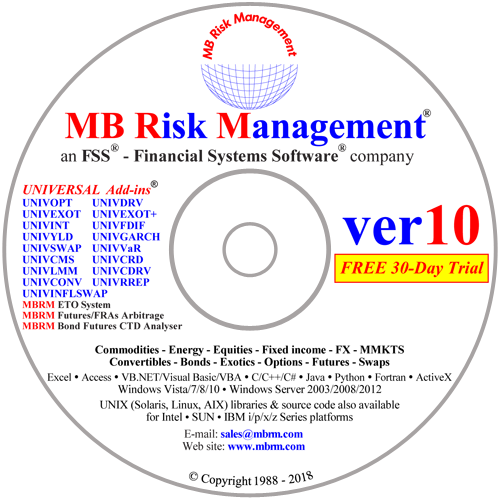 MBRM, MB RM, MB RISK MANAGEMENT, FSS, FINANCIAL SYSTEMS SOFTWARE, UNIVSWAP, UNIVERSAL SWAP ADD-IN, USA, UNIVEXOT, UNIVERSAL EXOTICS ADD-IN, UEA, UNIVOPT, UNIVERSAL OPTIONS ADD-IN, UOA, UNIVYLD, UNIVERSAL YIELD ADD-IN, UYA, UNIVZERO, UNIVERSAL ZERO ADD-IN, UZA, UNIVINT, UNIVERSAL INTERPOLATING ADD-IN, UIA, UNIVGARCH, UNIVERSAL GARCH ADD-IN, UGA, UNIVCONV, UNIVERSAL CONVERTIBLES ADD-IN, UCA and UNIVERSAL are trademarks of MB Risk Management. All rights reserved®. © Copyright 1988 MBRM - MB Risk Management. All rights reserved.